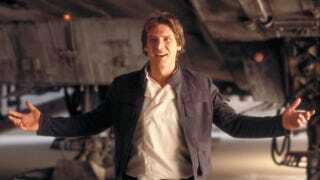 The Standalone Star Wars Movies: Young Han Solo and Boba Fett? The best thing about the plethora of Star Wars movie rumors that keep popping up? If you don't like one — like yesterday's hint that one would be about Yoda — just wait a day, and there'll be another. Or more, actually, since Entertainment Weekly just posted that they heard two of the stand-alone SW flicks will be "a young Han Solo saga, focusing on the wisecracking smuggler's origin story, and a bounty hunter adventure with Boba Fett at the center of a rogue's gallery of galactic scum." EW doesn't have any other details, other than the Han Solo movie would take place between Revenge of the Sith and A New Hope, and the Boba Fett/bounty hunter movie would be set between A New Hope and Return of the Jedi, but whether those are part of the rumors or are just educated guesses is unknown. Both of these sound a hell of a lot more fun than a Yoda movie, and I'd say Entertainment Weekly is generally a more trustworthy rumor source than most web sites. Still, if these two movies don't sound appealing, don't worry. There will almost certainly be another rumor tomorrow.